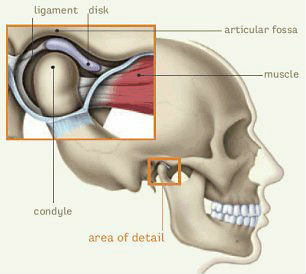 syndrome also called by name TMJ syndrome.It works to connect our jaw with the head(Skull) side,this joint is located at the bottom of our cheek bone both side of skull.When we speak,eat,chew then TemporoMandibular Joint get active.Those people who have TMJ Syndrome complain of pain at the time of eating,talking,while opening their mouth because this joint support and complete our jaw movement.There may be several reasons behind this problem, such as genetically,injury in jaw,teeth clenching,jaw misalignment,stress,arthritis etc.In most cases it has been seen that this problem TMJ syndrome is for a short time and recover itself or by some massage therapy.In rare cases surgery is needed where the condition is more serious. Those who have arthritis problems are more likely to have this TMJ syndrome.If you have been suffering from this problem for a long time you should meet the doctor and get treatment.The doctor will check you well and give the right advice. Avoid foods with saturated fats,fried food,meat,spicy food may promote inflammation in the body. If you want to do some things at home you will be relieved of pain.Gentle give massage to your jaws if you have more pain leave it and go to doctor.You can take some relaxation therapy,which will reduce the stress and you will get relief.